Olukunle Obadina, Chairman, Manufacturers Association of Nigeria (MAN) Apapa Branch on Thursday appealed to the Lagos state government to deploy resources toward eliminating traffic gridlock along Mile2 to Tincan Island/Apapa expressway. 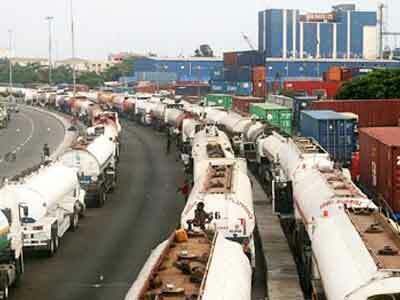 “We plead for government intervention in the rehabilitation of the road networks within the Apapa Tin-Can axis. “We want to see more actions on infrastructure development, especially on power generation through IPP schemes, improved road networks and more coordinated tax administration,” he said. Obadina said that the overall performance of the branch reflected a robust growing position and prudent management of cash resources. He listed as some of achievements of MAN as harmonised agencies, inspection in work places by LASG and reduction in the cost of several statutory charges. Obadina also identified reduction of penalty sum from N4million to N1million for defaulting member telecommunication companies as another achievement of the association. He also disclosed that the branch was able to put on hold the issue of water abstraction rates demanded by the state government among others. The financial statement of the branch showed that it recorded an income of N61.98 million for the financial year ended in Dec. 31, 2017, against N43.13 million in 2016, translating to an increase of 43.7 percent for the December 2017 financial year. The chairman lauded the efforts of the management of Dangote Group and Nigeria Flour Mills PLC for the rehabilitation of the Area B and Apapa Wharf Roads. Emmanuel Okonmah, Executive Secretary of the Branch, however, noted that the operating environment was not conducive for manufacturers due to difficulty in accessing forex coupled with lack of basic transportation system and poor power generation. Obadina decried the absence of rail system that would have linked the ports to the hinterlands, as well as underdeveloped inland waterways which he had led to increased congestion at the Lagos sea ports. Frank Jacobs, President of MAN, implored the Federal and State Governments to work in synergy with relevant stakeholders in manufacturing sector to fashion out appropriate strategies to improve and stabilise the economy. Jacobs said that the “lackluster performance“ of the national economy had in no doubt slowed down the Apapa Branch in terms of industrial development, relative to what it was in the past. “The manufacturing sector has been acknowledged as the highest contributor to job and wealth creation, skill development and technology transfer. “It is, therefore, imperative for the state government to institute a more effective and efficient consultative mechanism with the Manufacturers Association of Nigeria. “This is to ensure continued sustenance of existing manufacturing companies, some of which are at the verge of collapse under the weight of overwhelming infrastructural and other challenges,” he said.